Ah, I smell the odor of desperation in the morning. When the are showing Obama pulling ahead of Romney, it is required that Mitt Romney's billionaire boys step up with a proposal for a smear, and so they have. Disturbed that the President is well-liked, this particular proposal is to mount a coordinated media campaign to make him a little less likable. I should hasten to add that since this story , the Obama campaign has of failing to lead to a higher ground, Romney has responded by after the Obama campaign called him out on it, and the originator, Joe Ricketts (founder of TD Ameritrade and Chicago Cubs owner), has while claiming he is just an independent who is tired of government spending. Such are the days in the life of a national campaign. Repudiated or not, the is an instructive look at how these billionaire idiots hatch their plan, get PR flacks to put together a proposal, and agree to write a ginormous check for the whole shebang. The trial balloon went up earlier this year, when Mitt Romney invoked Jeremiah Wright in an interview with Sean Hannity, who loves to mention Wright's name whenever he can, preferably in concert with Bill Ayers'. It gives Hannity a tingle up his leg every single time, and Mitt obliged (audio at the top). The next 53 pages detail the plan to roll out a coordinated billboard, radio, TV ad and social media campaign during the Democratic convention which is intended to make independent voters dislike Barack Obama more than they do already. Never mind that this was tried and failed in 2008, never mind that then-candidate Hillary Clinton flogged the Jeremiah Wright boogie-man until she forced then-candidate Barack Obama into one of the finest moments of his candidacy, never mind that the overt racism of that campaign was so repugnant to so many that it no longer mattered what Jeremiah Wright said or what he actually meant. It failed, and failed miserably. I guess Ricketts figured it could be done better. With the assistance of PR flack strategist and principal of Fred Davis, a plan was hatched. It would involve finding "an articulate black man" and developing a narrative that "explains" how Barack Obama isn't such a nice guy, but a complete doofus who is a doofus because he listened to his "radical black pastor" for all those years. The plan was to roll out the campaign slowly, concurrent with the convention. They had planned a ridiculous 5-minute video that would be the centerpiece of their new domain "CharacterMattersPAC.com" (and .net and .org) clipping the well-known pieces of Wright's sermons and linking them to the President in ridiculous ways. Understand, the goal of this campaign was not to put forward some kind of smear. It was simply to make Barack Obama unlikable. Voters aren't that stupid. They weren't last time and they're not this time, but this is the radical crazy streak of conservatives that ooze racism, sexism, and a whole lot of unlikability. Fred Davis, Republican Party "Strategist"
Which brings me to , author of this crazy proposal. Fred Davis mostly works for ultra-conservative Republicans, though he did manage to put together a few ads for John McCain in 2008. He's run ad campaigns for Christine O'Donnell, Sarah Palin, and Carly Fiorina. Yes, Davis is the father of the incredibly cheesy and amazingly stupid "" ad, which went viral but didn't do a darn thing to help elect Fiorina. Davis is the nephew of ultra-conservative Senator James Inhofe, too. One morning Davis is on his laptop putting the finishing touches on "Mourning in America," a 60-second spot that will air nationally beginning Wednesday. Davis designed it as a reverse take on "Morning in America," the optimistic 1984 ad that evoked American renewal and was a centerpiece of President Ronald Reagan's reelection campaign. In Davis's version -- paid for by Citizens for the Republic, the modern-day offshoot of Reagan's political action committee -- the narrator has a similarly deep voice and there are eerily similar montages of flags, weddings, back yards and downtown streets. But instead of talking about homeownership and new jobs, low interest rates and decreasing inflation, Davis's narrator warns of foreclosures and unemployment to paint an America in decline under Obama. Davis is at his glass conference table trying to dial into a conference call. Voice-over veteran Ben Holland is on the other end in a sound studio reading the script in his deep baritone. But Davis can't get the speakerphone to work. "I have every technological marvel known to man here and I can't operate a single thing," Davis says. Nor, it seems, can he figure out how to smear President Obama, a man who has shown himself to be of impeccable character and above such petty smears. It just drives conservatives mad to the point of frothing at the mouth that they can't find any infidelity or financial malfeasance to bandy about the campaign trail, so they resort to his otherness, his blackness, the fact that he's not like us. Here's an unfortunate fact for those white guys inventing this kind of racist claptrap. The majority of people in this country are not white. . They'd better learn to get over their fetish with whiteness, and start embracing what is rapidly becoming the land of white, black, brown and everything in between. Since Joe Ricketts cashed in a in order to finance this campaign, I'm certain we will see something in the months and days ahead that isn't exactly like this one, but with the same goal. 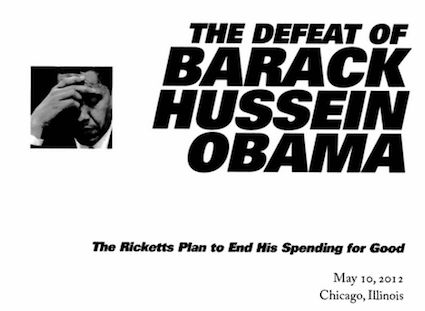 Figure that an "independent" campaign intended to hit at President Obama's "likability" is a campaign financed by Joe Ricketts. Romney on his quote to Sean Hannity re: Rev. Wright: "I stand by what I said, whatever it was." So I think it's reasonable to assume that when the dust dies down from this story, they'll proceed with the plan, don't you think? In the meantime, Rahm Emanuel is, well, .